When I was new at GFE we met one day with a representative of the SFPUC who was helping us plan some signs for the garden. “Of course you folks know the basics already, like point and non-point pollution.” I nodded wisely, but in fact I had no idea what she was talking about. As it turns out, point pollution is pollution coming from one point, like the smokestack of a power plant. It can be measured, regulated, even shut down by political action. Non-point pollution is what we all do at home, by spraying our roses, putting out rat poison, putting Drano down the drain. It’s much more difficult to control. And that’s not what I’m going to talk about, because the idea that we can “save the planet” by personal sacrifices, and it’s our fault for living, is so 90’s. It frames the problem in terms of bad consumers, not in terms of rapacious companies and reactionary politicians. It’s like telling women to dress differently to stop harassment (thank you Rebecca Solnit). Why are rat poisons which kill owls and hawks on the shelves? Why aren’t they illegal? Why isn’t there small business support to develop companies who can clear your garden of rodents with cute little dogs? We have incredibly sophisticated technology these days, but we can’t invent a rodenticide that doesn’t kill pets and wildlife? Oh, come on. 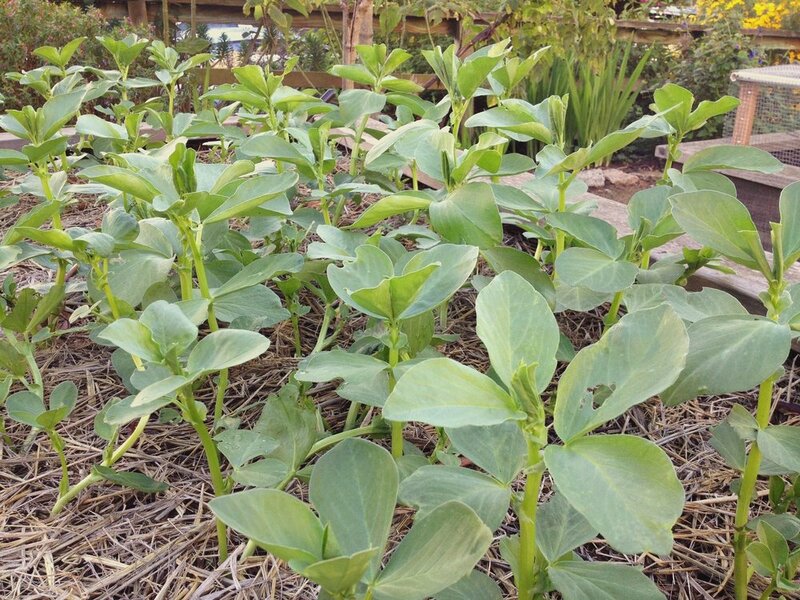 Fava beans rising up - the smallest of steps can create a wave of change. What I do want to talk about is the opposite of non-point pollution. And that would be non-point regenerative climate action. As individuals, we can each take regenerative climate action, not just stop doing “bad” things. There is so much hope here. Because when we set up a greywater system, or remove concrete to make a sidewalk garden, or plant fava beans at our kid’s school, it changes the conversation. Our kids, our friends, our neighbors learn from us that there ARE things we can do to reverse climate change. It becomes a wave of new ideas without any obvious source. We can lead the way for our politicians. Back in the 1960s, everyone laughed at us “hippies” for recycling. Now many parents in San Francisco are teaching their kids how to sort for recycling and green waste. City law and the Recology company have structured recycling into everyday life. Everybody in this conversation is working with the idea that we have to reduce trash, because we don’t want to burn it, or landfill it, or dump it in the ocean. It’s a completely different conversation, motivated by a desire to protect natural cycles (and not get a ticket). Imagine. Wouldn’t it be great if we could take the next step, and everybody could be engaged somewhere in growing green plants to build living soil (which takes greenhouse gases out of the air) and allow water to penetrate our tough concrete city and recharge our aquifers? Planting a seedling and holding a worm can give kids the connection they need to value our environment. Not everybody has a garden, but everybody has a sidewalk, where there could be street trees and sidewalk gardens. Every kid and parent has a school, which could and probably does have a garden which needs help. Every neighborhood has parks, undeveloped weird little open spaces, and community gardens. You say “but I’m number 300 on the list for a community garden space.” Why is it like this? It’s a political problem that we don’t have enough community gardens developed. Let’s talk to the supervisors. We fit into this effort at GFE by teaching kids and grown-ups how to garden in an organic and regenerative way. But the next barrier that stops people from gardening is... plants cost money. And that calls for a new resolution. Every year when our fall intensive Get Up! program ends, twenty or so newly trained garden educators and activists are let loose in San Francisco. Watch out! They go on to work with all kinds of green projects all over the city. And they do not leave GFE unchanged. This year, they started a new propagation bed, where we are going to grow fool-proof and quick-growing plants which we can easily divide and give away. The 2018 Get Up! class posing in front of their newly planted propagation bed. Before too long, we are going to be able to end volunteer days or classes by offering free plants to our students and volunteers. These will all be beautiful perennials which require very little care and don’t need much summer water once they are established. As more people are able to plant these in their yards and sidewalk gardens and schools, our city becomes closer to what we want it to be: a leader in greening intensely populated urban spaces. Come on out and help if you are looking for a bit of earth to work in. We need all hands on deck as we move either towards or away from the tipping point for climate change.